In a heavy-bottomed pan mix sugar (crystals) and tartaric acid with a 150 ml of water. Bring it to a boil on medium flame. Add the milk to the syrup. A scum will start forming on the surface of the boiling sugar syrup. Remove the scum with the help of a spoon. Boil the sugar syrup and keep checking the consistency. The syrup should be of three-thread consistency. Roast the khoya, till brown in color, in a frying pan. Mix the roasted khoya with powdered sugar and half of the syrup in a pan. Grease a tray with ghee and spread the mixture on it. When the mixture is cooled to the room temperature and set, cut into pieces. Roll the cut brown burfi pieces on the plate so that they get coated with the sweetened khus khus. 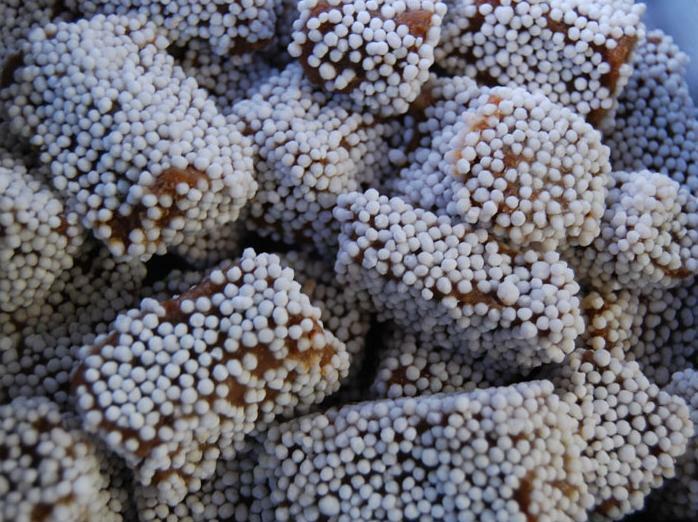 Roll the cut bal mithai pieces in the sugar balls, so that they coat evenly. Bal mithai is ready to be served. 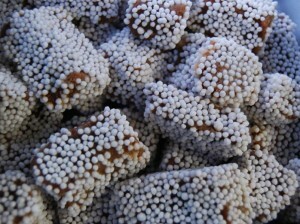 Bal mithai can be stored, in air tight container, for a week.